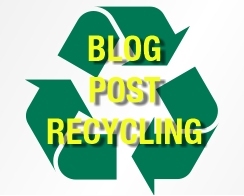 How to Recycle your Old Blog Posts to Increase Web Traffic? Recycling your Old Blog articles/posts means doing an update with them such as editing any old data with the latest update, including new photos, images, update broken links, adding inter links to your site/blog, providing some extra layer of information and news with the current one, changing permalinks, date and many more. You should must update your old blog posts from time to time and hence provide the latest and true information to your readers for better traffic and post quality. Thats the only reason why your visitors never let your post unread. I still believe in "OLD IS GOLD". To overcome with the Writer’s block Writer’s block is a condition, associated with writing as a profession, in which an author loses the ability to produce new work. The condition varies widely in intensity. To save yourself from Google Panda and Penguin Update. You would be more able to expose your articles to more readers now (assuming your blog is comparatively more popular now) than to the handful of visitors you had when you posted it previously. Flow of Traffic to your inter Pages and Posts. Lastly People want Update and Update only that means recycling your old Blog posts with an update in data makes a better understanding between you and the visitors. How to Recycle your Old Blog Posts? Michael Hyatt recommends, tweet your old posts once a day. Reposting works on Facebook too. Sometimes I've posted older posts on Facebook and labelled them "oldie but goodie" so people know it's not new. You can combine a bunch of your old posts into a PDF or even an ebook. You could give it away for free or you could sell it. A lot of people will pay for the organization of old content. Republishing your old blog post again and then share it to the online Social media sites. Link internally of course. Link to older posts in your new ones whenever possible. Archive 'em. In my new website design I added an Archives page and I've gotten a lot of great feedback from people who say it's been so helpful to see all my older posts at one glance. Do not forgot to interlink/add new pages and posts to your old post to enjoy PR (PageRank) juice wisely. Always use the Related Posts Plugin or LinkWithin to automate the process of listing older content at the end of your posts. Or, consider adding related posts manually for a more refined selection etc. Make your old blog posts evergreen.